Most developing countries have less than 30 percent cadastral coverage. This means that over 70 percent of the land in many countries is generally outside the land register. This has caused enormous problems for example in cities, where over one billion people live in slums without proper water, sanitation, community facilities, security of tenure or quality of life. This has also caused problems for countries with regard to food security and rural land management issues. The Global Land Tool Network (GLTN), facilitated by UN-HABITAT and funded by Norway and Sweden, is a coalition of international partners, including FIG (the International Federation of Surveyors), ITC (University of Twente, Faculty of Geo-information Science and Earth Observation, The Netherlands), and the World Bank (WB), has taken up this challenge and is supporting the development of pro-poor land management tools, to address the technical gaps associated with unregistered land, the upgrading of slums, and urban and rural land management. The security of tenure of people in these areas relies on forms of tenure different from individual free hold. Most off register rights and claims are based on social tenures. 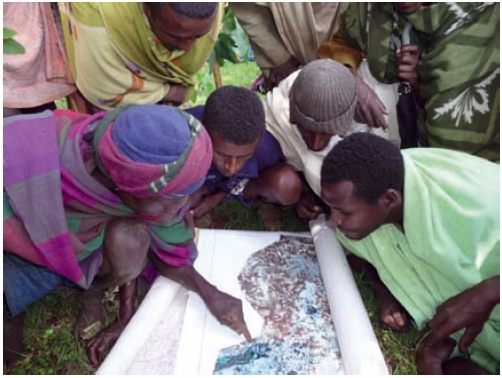 GLTN partners support a continuum of land rights, which include rights that are documented as well as undocumented, from individuals and groups, from pastoralist, and in slums which are legal as well as illegal and informal. The chair of Working Group 7.1 of Commission 7 on Cadastre and Land Management, Christiaan Lemmen, took the lead from 2002 onwards, in the development of the STDM in close co-operation with UN-HABITAT. ITC, financially supported by the GLTN, developed a first prototype of STDM, that is supported by WB. This FIG Report presents the need for STDM, the properties of STDM as a tool, and the benefit and use of STDM as a key means of meeting the Millennium Development Goals (MDGs). Land Administration Systems (LAS) provide the infrastructure for implementation of land polices and land management strategies in support of sustainable development. The infrastructure includes institutional arrangements, a legal framework, processes, standards, land information, management and dissemination systems, and technologies required to support allocation, land markets, valuation, control of use, and development of interests in land. In many countries such infrastructure is not available with a nationwide coverage. In fact this is the case in only 25 to 30 countries worldwide. Further it can be observed that existing LAS have limitations because of the fact that informal and customary tenures cannot be included in these registrations. Generally, the Land Administration Systems are not designed for this purpose. Existing LAS require extensions to include all existing types of tenures. But the need for this is not always recognised and institutional changes are not so easy to implement. 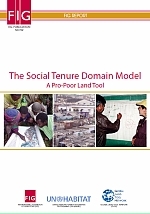 The Social Tenure Domain Model (STDM) could close this gap: STDM allows for the recordation of all possible types of tenures; STDM enables to show what can be observed on the ground in terms of tenure as agreed within local communities. This agreement counts as evidence from the field. People, living in informal area’s in developing countries, who are visited by someone with an enlarged satellite image or aerial photo in his or her hands will give attention to this image or photo. The visitor will be surrounded by many people almost immediately. People really understand what they see on the image. They can identify the place where they live, and where their neighbours live. See Figure 1. Surveyors as land professionals are needed in support and management of this type of data acquisition of ‘people – land’ relationships. This is asking for widening the scope in relation to land administration; apart from traditional field surveys related to formal tenure there can be a context as described for informal tenures. Surveyors understand that there can be differences in spatial accuracies resulting in different accuracy quality labels. Surveyors can not only provide accurate maps but they also know how accurate the map is or should be for the purpose. And surveyors have experience in land administration based on observations on site. UN-HABITAT, with support of FIG and WB, developed STDM into a first prototype, based on an open source database with open GIS software, in close cooperation with ITC. FIG and UN-HABITAT are involved in the development of an ISO-standard for a land administration domain model (LADM), including the STDM1). As soon as this ISO-standard is available it can be used by open source communities and by commercial software integrators to develop Land Administration Systems. The ISO-standard can be adapted and extended for local purposes and avoids reinventing the wheel. 1) The LADM is under development within the Technical Committee 211 (TC211) of the International Organization for Standardization (ISO) and identified as ISO 19152. FIG took the initiative for this standardised domain model for the Land Administration Domain. UN-HABITAT is involved in this development. This International standard is expected to be available in 2011. There is a gap in conventional land administration systems: customary and informal tenure cannot be handled. There is a need for unconventional approaches in land administration. Where there is little land information, there is little or no land management. Conventional Land Administration Systems are based on the ‘parcel approach’ as applied in the developed world and implemented in developing countries in colonial times. A more flexible system is needed for identifying the various kinds of land tenure in informal settlements or in customary areas. Traditional land surveys are costly and time consuming. For this reason alternatives are needed; e.g. boundary surveys based on handheld GPS observations, or by drawing boundaries on satellite images. This means of course a different accuracy of co-ordinates. Surveyors understand this and surveyors are needed to provide quality labels and to improve the quality of co-ordinates at a later moment in time. The need for a complete coverage of all land by LAS is urgent. Not only for the registration of formal rights and for the recordation of informal and customary rights. Also for managing the value, the use of land and land development plans. This relates to Enemark’s model on the global land management perspective; see Figure 2. Complete coverage of all land in a Land Administration is only possible with an extendable and flexible model, that enables inclusion of all land and all people within the four land administration functions. So STDM will close part of the technical gap in developing countries in terms of making Land Administration covering the total territory. Impact of disasters, like the 2010 earth quake in Haiti, are difficult to manage because it is not clear which lands are available for people to be temporally resettled in tents. After the 2004 tsunami there was land grabbing where owners had passed away. It is also known that children of parents having aids lost their living place after parents had passed away. It is astonishing that interventions in the daily life of communities by mining industries, by mega farming, or by deforestation are awarded by governments with land titles, while the rights of local communities are not recognised. At the same time local communities discriminate women, where access to land is concerned, in contradiction to national land policies. Given today’s problems related to urbanisation, environment, access to land, and access to food and water there is a need to get a complete overview of who is living where, under which tenure conditions, and for which areas. Overlapping claims to land need to be included as well as Illegal acquisition or occupation of land. A complete map of ‘people – land’ relationships is needed. Such a more flexible extension of LAS should be based on a global standard and should be manageable by local communities them self from the start. Standardisation allows for integration of data collected by communities into formal LAS at a later moment in time. It should not be misunderstood that formal land titling is important and necessary, but it is not enough on its own to deliver security of tenure to the majority of citizens in most developing counties. Customary tenure and informal settlement tenure have a very strong influence. Individual land titling often works against the needs and aspirations of poor people, also because of its cost. Rich landholders are often against land titling because it will visualise the areas which may be grabbed. Or they may be interested in which areas are not in the official system, thereby knowing which areas are available for land grabbing. 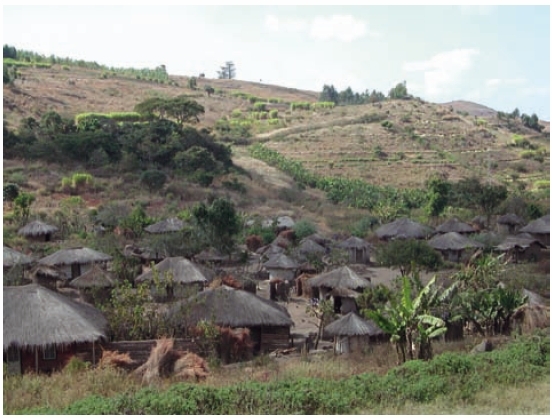 Land tenure: the allocation and security of rights in lands; the legal or informal surveys to determine boundaries of spatial units; the transfer of formal or informal rights or use from one party to another through sale or lease; and the management and adjudication of doubts and disputes regarding social tenure relationships and boundaries. Land use: the control of land use through the adoption of planning policies and land use regulations at national, regional and local levels; the enforcement of land use regulations; and the management and adjudication of land use conflicts. Land development: the building of new physical infrastructure; the implementation of construction planning and change of land use through planning permission and the granting of permits. Inevitably, all four functions are interrelated. The interrelations appear because the conceptual, economic, and physical uses of land and properties serve as an influence on land values. Land values are also influenced by the possible future use of land determined through zoning, land-use planning regulations, and permitgranting processes. And land-use planning and policies will, of course, determine and regulate future land development. Land information should be organized to combine cadastral and topographic data and to link the built environment (including legal and social land rights) with the natural environment (including topographical, environmental, and natural resource issues). Figure 2: Land Administration Systems provide the infrastructure for implementation of land polices and land management strategies in support of sustainable development. land administration, in support of their own development. UN-HABITAT proposed the ‘continuum of land rights approach’ in 2003 and this was further developed and adopted by the Global Land Tool Network partners. An example of the continuum is given in Figure 3. Figure 3: GLTNs Continuum of Land Rights. In conclusion there is an urgent need to have a land information system that works differently and in addition to the conventional land information system. Land tenure types, which are not based on formal cadastral parcels and which are not registered, require new forms of land administration systems. The concept of STDM is closing the gap, a standard for flexible ‘people – land’ relationships. The Social Tenure Domain Model (STDM) is basically about people. It is about all people and all types of ‘people – land’ relationships. How can informal settlements be “illegal settlings”? People depend on land for living. Every human being needs a place – a safe place. The STDM is under development as an ISO-standard as a so called “specialisation” of the Land Administration Domain Model (LADM). The word “specialisation” means that there are some differences in terminology: what a “real estate right” is in a formal system is considered as a “social tenure relationship” in STDM. Note that a formal right is also a social tenure relationship, but not all social tenure relationships are formal land rights. ‘People – land’ relationships can be expressed in terms of persons (or parties) having social tenure relationships to spatial units. Parties are persons, or groups of persons, or non natural persons, that compose an identifiable single entity. A non natural person may be a tribe, a family, a village, a company, a municipality, the state, a farmers´ cooperation, or a church community. This list may be extended, and it can be adapted to local situations, based on community needs. Land rights may be formal ownership, apartment right, usufruct, free hold, lease hold, or state land. It can also be social tenure relationships like occupation, tenancy, nonformal and informal rights, customary rights (which can be of many different types with specific names), indigenous rights, and possession. There may be overlapping claims, disagreement and conflict situations. There may be uncontrolled privatisation. Again, this is an extensible list to be filled in with local tenancies. A restriction is a formal or informal entitlement to refrain from doing something; e.g. it is not allowed to have ownership in indigenous areas. Or it may be a servitude or mortgage as a restriction to the ownership right. There may be a temporal dimension, e.g. in case of nomadic behaviour when pastoralist cross the land depending on the season. This temporal dimension has sometimes a fuzzy nature, e.g. ”just after the end of the rainy season”. Spatial units are the areas of land (or water) where the rights and social tenure relationships apply. According to the LADM/STDM ISO-standard those areas can be represented as a text (“from this tree to that river”), as a single point, as a set of unstructured lines, as a surface, or even as a 3D volume. This range of spatial unit representation can cover community based land administration systems, or rural, or urban, or other types of land administrations, like marine cadastres and 3D cadastres. Surveys may concern the identification of spatial units on a photograph, an image or a topographic map. There may be sketch maps drawn up locally. A sketch map may be drawn on a wall where a photograph is taken from. 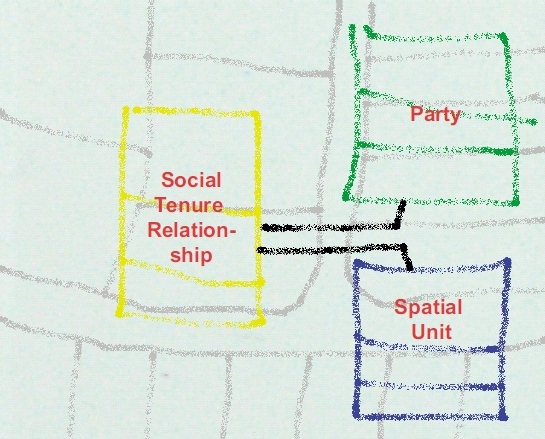 See Figure 4 for the core – parties, social tenure relationships and spatial units – of the STDM. Figure 4: The core of the STDM: parties (tribes, people, villages, co-operations, organisations, governments), social tenure relations (‘people – land’ relationships, which can be formal, informal, customary or even conflict), and spatial units (representations from reality where the social tenure occurs, can be represented as sketch based, point based, line based, polygon based). In conclusion, the flexibility of STDM is in the recognition that parties, spatial units and social tenure relationships may appear in many ways, depending on local tradition, culture, religion and behaviour. Recordation in STDM may not only be based on formal registration of formal land rights, but may also be based on observations in reality, resulting in recordation of informal land use rights. This is also one of the principles of FIG’s ‘Cadastre 2014’. The provision of land information in all areas and for all citizens will support in poverty eradication. Hernando de Soto states that “civilised living in market economies is not simply due to greater prosperity but to the order that formalised property rights bring”. If the world’s community is sincerely of the opinion that appropriate land administration systems are required for the eradication of poverty, sustainable development and economic development, then it will be evident that attention should be devoted primarily to the land administration systems of developing countries. Until today most countries (or states, or provinces) have developed their own LAS. Some countries operate a deeds registration, while others operate a title registration. Some systems are centralized, and others decentralized. Some systems are based on a general boundaries approach, others on fixed boundaries. Some LAS have a fiscal background, others a legal one. STDM can contribute to sustainable development by the provision of a flexible, unconventional land administration. This can be seen as an extension to existing LAS. This may have a start in community based mapping processes, supporting the mapping of land and property rights. Often local communities lack knowledge on land laws and areas where those communities are living are not administered. Many organisations have attention to this issue and there are networks like the ‘indigenous mapping network’, established by anthropologists. 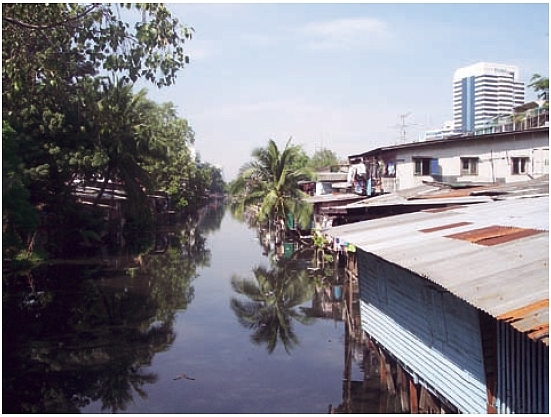 Also slum mapping in relation to tenure is an issue of international attention. Depending on the local situation, different registrations or recordings of land rights are possible. In rural areas there can be spatial units covering customary areas. Those spatial units can be recorded as ‘text based’ spatial units, where boundaries are described in words. Or as ‘line based’ spatial units, drawn on low accurate satellite images; see Figure 5. The tribe may be represented by its chief. Formal property based spatial units can concern formally registered ownership with related owner and with identified boundaries by accurate field surveys. Persons living in ‘structures’ in slum areas may be identified by fingerprints; see Figure 6. 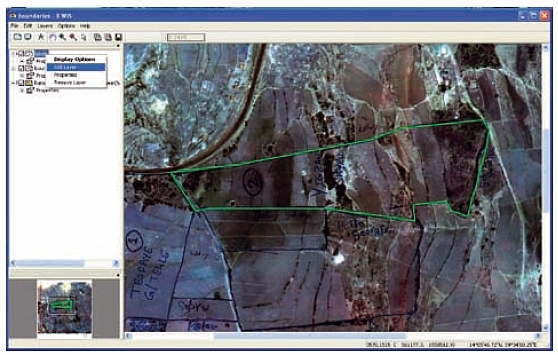 The social tenure relationship to the spatial units may be represented by points collected with hand-held GPS instruments – source documents may be printed from websites providing spatial data. Spatial units in urban business districts can be conventional parcels with high accurate boundaries. Spatial units in residential areas can be derived from aerial photographs. If all data are collected in the same structure (Party – Social Tenure Relationship – Spatial Unit) then the integration with a formal LAS is possible. The STDM approach will open up new markets to the land industry and it will also be an opportunity to develop new skills and to improve management skills. STDM can make it possible for all citizens to be covered by some form of LAS, including the poor, thereby improving the land management capacity of the land industry, as well as addressing upcoming challenges such as climate change. Also, STDM can contribute to poverty reduction, as the land rights and claims of the poor are brought into the formal system over time. It will improve their security of tenure, increase conflict resolution, limit forced evictions, and help the poor to engage with the land industry in undertaking land management such as city wide slum upgrading or rural land management. 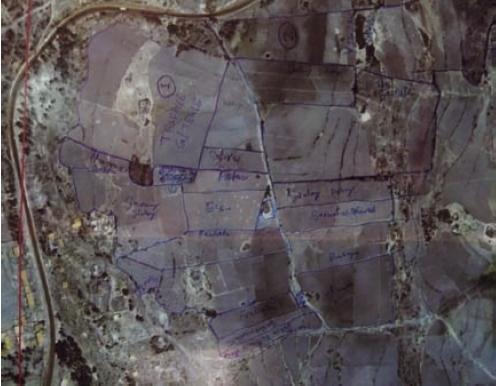 Figure 5: Collected data on top of a satellite image, drawn with pen. Paper with sufficient quality is needed for use in the field: dust, sunshine and water… and: many hands holding the paper. Figure 6. Screendump STDM prototype software. 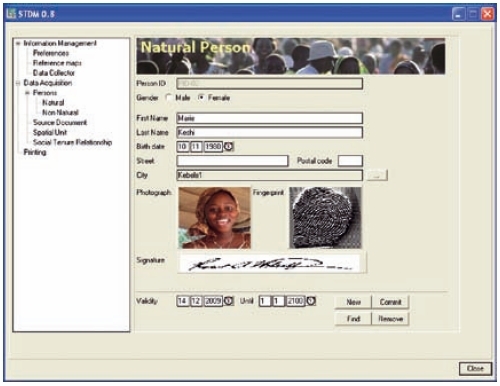 An example where a fingerprint and a photo of a land user are represented in the user interface. This person can be related to spatial units (e.g. a single point) via social tenure relations. Mindset – this is an invitation not to start saying why the STDM implementation is impossible because of existing legislation or because of existing institutional settings. No, it is an invitation to start thinking how STDM could be implemented to represent all ‘people – land’ relationships, which can be observed in a community. Starting as a community based land information system, that can be linked with, and eventually incorporated into a formal system in the future. The fact has to be accepted, that more social tenure relationships exist than statutory land rights, especially at the political and higher administrative levels. This is best expressed by inclusion in a land policy. The relevant land agencies and involved private practitioners need to be willing to adapt their ways of working to allow for dealing with the concepts of STDM as compared to the ‘conventional land administration’ approach, including recognition of a range of rights and mechanisms to gather the date of these rights on a community based participatory approach. Expertise is needed both in land administration and in ICT for each office where the STDM software is used. The dilemma between community access and the scale needed for ICT support needs to be solved in an appropriate manner. Awareness and a culture of updating that means (a) for the social tenure holders the awareness that they should report changes in their social tenure relationships and (b) for the administrative system supporting STDM, that they should process reported changes and (c) keep the requirements for reporting simple enough to remain accessible for all, including the poor. First the data need to be acquired. Communities (villages, co-operations, slum dwellers organisations, or non governmental organisations) can organise this. However, they are in need of tools. On-site tests have been performed of the potential use of high resolution satellite images to establish parcel index maps in selected villages. After printing the images on paper in a 1:2000 scale, the boundaries of spatial units were determined in the field using a pencil. The data collection in the field was performed in the presence of land right holders and local officials. Apart from the boundaries, administrative data like village names were collected. The understanding of the paper prints in a 1:2000 scale was high, which makes the process very participatory. After field data acquisition the images, with drawn boundaries on it, were scanned and brought back on top of the original image. The drawn boundaries were vectorised and got identifiers. During field data collection preliminary identifiers may be used. After vectorising the spatial data can be linked to the person data using a spatial tenure relationship. Then the data have to be brought to the local communities for public inspection, e.g. by the projection of images and boundaries on a screen (if electricity is available). Local people can be invited to check the data. Later on it should be possible to perform unconventional transactions; e.g. to change a social tenure relationship from “informal” to, for example, “occupation” and later to “free hold”. Hand-held GPS based data capture is possible, however not understood by the local people. In general it can be stated that imagery or tape based observations are well understood with regard to participatory approaches. In STDM evidence from the field can be scanned and included as an authentic source document. See Figure 7. Different types of source documents are possible: images, maps, photo’s, etc. Figure 7: Screendump STDM prototype software. An example case where drawn boundaries are vectorised to closed polygons. Those polygons can be related to persons via social tenure relationships. Capacity building is needed before going to the field. This is easy with images. The use of ‘digital pens’ seems very interesting for data collection purposes. With digital pens, the drawn lines on the paper images can be read by a computer and are geo-referenced immediately. This means that scanning is not needed. called “illegal rights”. This is in fact neglecting what can be observed in reality. The officials know this. People need a shelter somewhere and in many cases the government did observe informal areas but did not interfere for a long time. How to move from a conflict situation (conflicting claims) to a formal one? Again a “what to do list” for the government – upgrade the rights or take other decisions based on the recordation of rights. Women’s access to land – this can be organised by registration of shares in rights. This is supported in STDM. Data quality of spatial data may be improved in a later stage of development. Note that there may be a serious need for accurate geo data in slum areas: the value of land in slum areas near city centres can be very high. In conclusion, the STDM concept is supportive in community based data acquisitions. This gives people the feeling that the data are their own data. Later the data can be formalised and integrated in formal systems. This is possible because of a standardised approach. The status and the way forward to completion. The Global Land Tool Network (GLTN), a coalition of international partners, including FIG and ITC, has taken up this challenge and is supporting the development of propoor land management tools, to address the technical gaps associated with unregistered land, the upgrading of slums and rural land management, among other things.The security of tenure of people in these areas relies on forms of tenure different from individual freehold. Most off register rights and claims are based on social tenures. GLTN partners support a continuum of land rights, which includes rights that are documented, undocumented, from individuals and groups, from pastoralist, in slums, which are legal, illegal and informal. The technical gap covered by STDM is on the critical path of the delivery of a number of Millennium Development Goals namely, Goal 1 on food security, Goal 3 on the promotion of gender equality and the empowerment of women, and Goal 7 on ensuring environmental sustainability, including improving the lives of slum dwellers. A first prototype of STDM1 has been developed at ITC for the purpose to test the concept, the look and feel, and the way transactions are implemented. As soon as this is evaluated a version will be available to support the input and maintenance of comprehensive data sets. The specifications have to be available for software development by open source communities or by commercial software suppliers. Open Source means that developments in software can be shared. Both Open Source software and commercial software will be needed – depending on the level of development of land administration. Relative small amounts of data may be manageable with open source software. Huge amounts of data, to be accessible 7 × 24 hours, will require information management by commercial software, at least as long as there is insufficient expertise on Open Source products (database and GIS). In conclusion, STDM is a pro-poor tool and the development of the concept and a first prototype is funded by GLTN and supported by FIG – the global community of land administration professionals. The role of FIG is therefore in the area of advocating this model from a professional point of view and to provide the professional environment for its development and implementation. Augustinus, Clarissa (2010): Social tenure domain model: what it can mean for the land industry and for the poor. XXIV FIG International Congress: facing the challenges, building the capacity, April 2010, Sydney, Australia. Augustinus, Clarissa, Christiaan Lemmen and Peter van Oosterom (2006): Social tenure domain model: requirements from the perspective of pro-poor land management. 5th FIG regional conference: promoting land administration and good governance, March 2006, Accra, Ghana. De Soto, Hernando (2003): The mystery of capital: why capitalism triumphs in the west and fails everywhere else. New York, NY, US. Basic Books. Lemmen, Christiaan, Clarissa Augustinus, Peter van Oosterom, and Paul van der Molen (2007): The social tenure domain model: design of a first draft model. FIG Working Week 2007: strategic integration of surveying services, May 2007, Hong Kong SAR, China. UN (2000): United Nations Millennium Goals Declaration. United Nations General Assembly, New York, US. Williamson, Enemark, Wallace, and Rajabifard (2010): Land Administration for Sustainable Development. ESRI Press Academic. Redlands, California, US. Zevenbergen, Jaap and Solomon Haile (2010): Institutional aspects of implementing inclusive land information systems like STDM. XXIV FIG International Congress: facing the challenges, building the capacity, April 2010, Sydney, Australia. Without the support and contribution of Dr. Clarissa Augustinus, Prof. Dr. Peter van Oosterom, Dr. Solomon Haile, Prof. Paul van der Molen, Prof. Dr. Jaap Zevenbergen and Prof. Stig Enemark the concept of the Social Tenure Domain Model could not have been developed. Also the ISO 19152 Project Team, drafting the Land Administration Domain Model, were constructive in their support for the Social Tenure Domain Model. This is a big step forward in the development of Land Administration Systems. Martin Schouwenburg, Liliana Alvarez, Jan van Bennekom-Minnema and Monica Lengoiboni prepared the first STDM prototype software. Remy Sietchiping and Hemayet Hossain provided valuable advice during the development. Thanks for all your support.